After a morning spent “restoring” our Jeep Grand Cherokee to its former glory (following it’s heavyweight confrontation with two Cactus plants on the Apache Trail), we set a course for Tucson, which if one drives in a straight line, is 116 miles SE of Phoenix, and less than a 2 hour drive. Of course, we rarely drove anywhere in a straight line during our road trip, and our chosen route to Tucson would be no different. On many of our adventures over the past 15 years, our starting point for planning has been a trip to Chapters to see if there was an “Eyewitness Travel” book for our chosen destination. 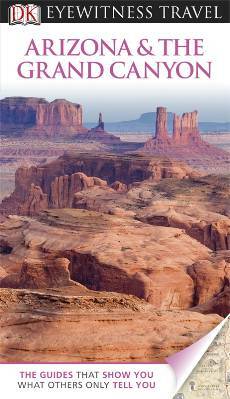 This trip was no different and we picked up two of their publications – one for Arizona & The Grand Canyon, the other for Santa Fe & Albuquerque. 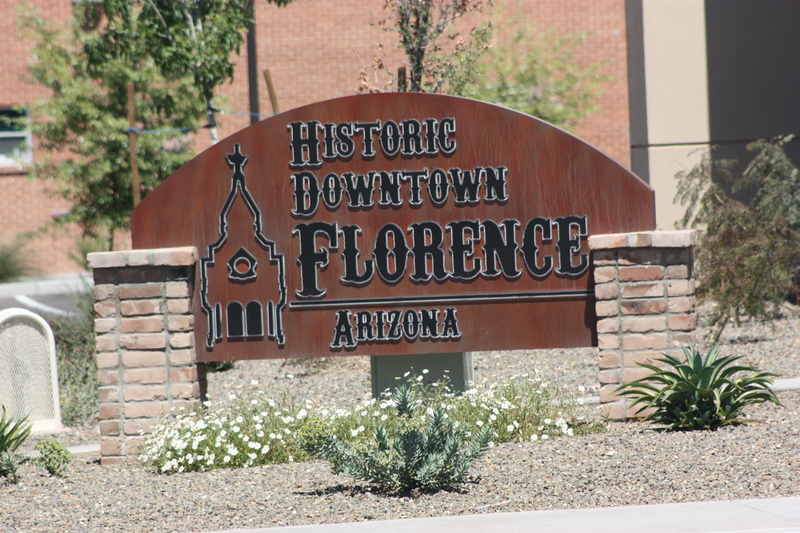 In the Arizona edition, I had read about a scenic route option that would see us drive east to Apache Junction from our hotel in Mesa, then south on US-79 through the “historic” town of Florence. From there the route continued through Coolidge, where the Casa Grande Ruins are located. This loop drive would eventually take us back to the I-10 heading SE for the last 70 miles or so into Tucson. We made a brief stop at Paradise Bakery for Sunday brunch, then made our way onto southbound US-79. 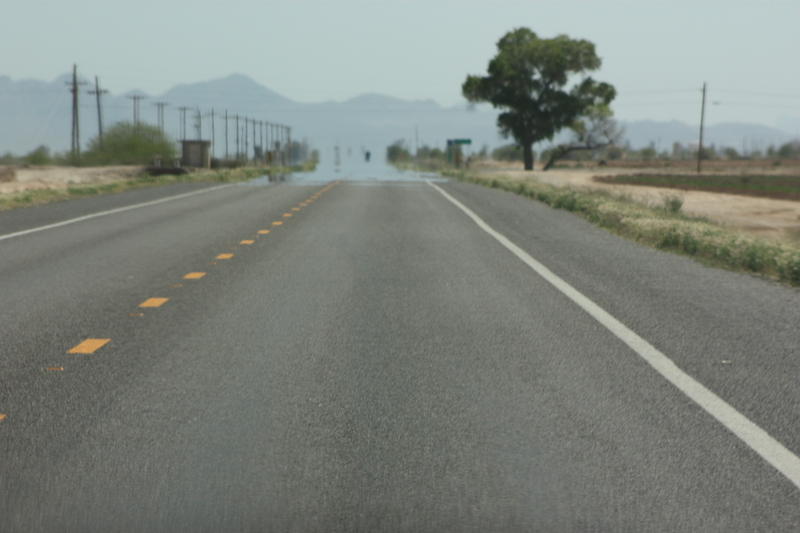 It was a very hot day as evidenced by the picture below which shows the heat rising off the highway. Mary remarked that she hadn’t seen that particular phenomenon since our “Ontario days”. A short 30 miles into the drive we approached the town of Florence, and I was on the lookout for a pyramid, having been alerted to its’ presence by our “Arizona Curiosities” book – another occasionally handy research tool. 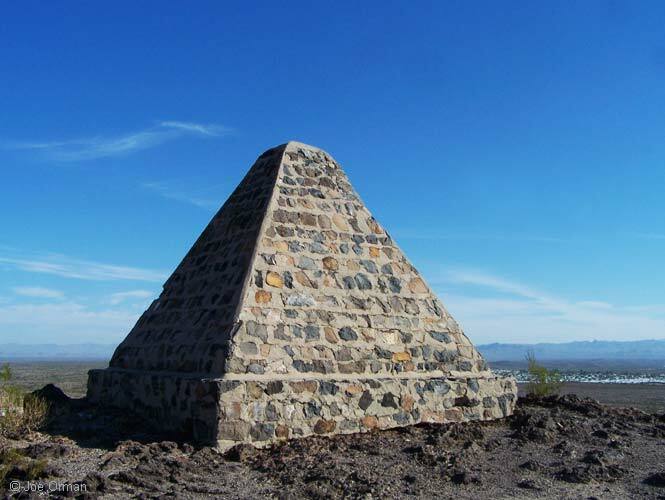 The pyramid is located atop Primrose Hill on Hunt Highway, just a mile north of the city, and it is the final resting place of Charles Poston, a man referred to as the “Father of Arizona”. 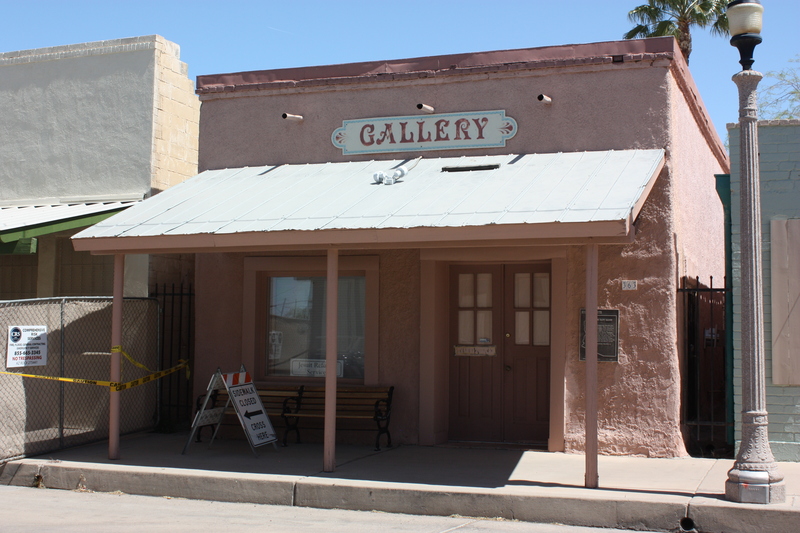 Poston lobbied Abraham Lincoln and the United States Congress to create the Territory of Arizona in 1863 which eventually led to its’ statehood, although not for another 49 years (Arizona was the last of the 48 contiguous states to be admitted to the Union, in February of 1912). The reason for the pyramid is that Poston had journeyed to the far east and had become enamoured with the notion of “sun worship”. 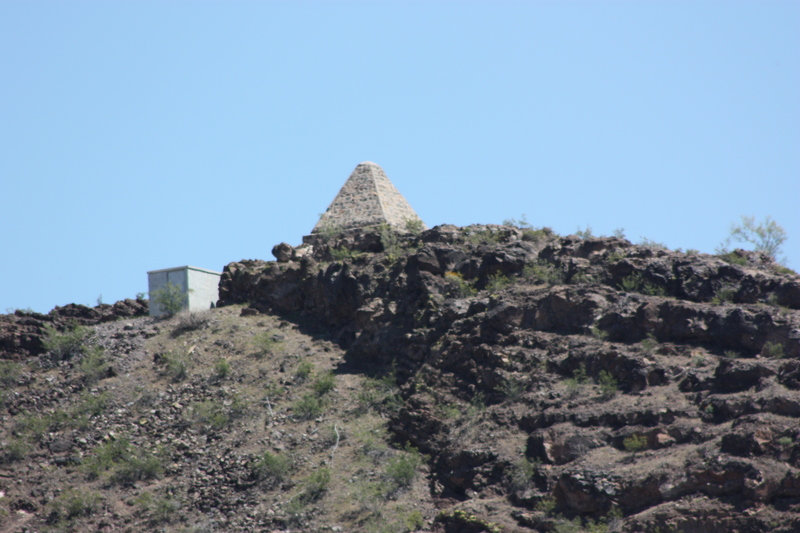 He had actually envisioned building a large pyramid in Arizona, but never realized that dream in his lifetime. Instead he was buried atop this hilltop within a small pyramid-like monument erected in his honour by the Territory of Arizona in 1906, four years after his death. Today, the pyramid is a roadside novelty. Back on US-79 we approached the town of Florence, and passed the first of three State prisons that are located in and around this town. I mention the prisons in that they dominate the landscape on both the north and south end of the town. 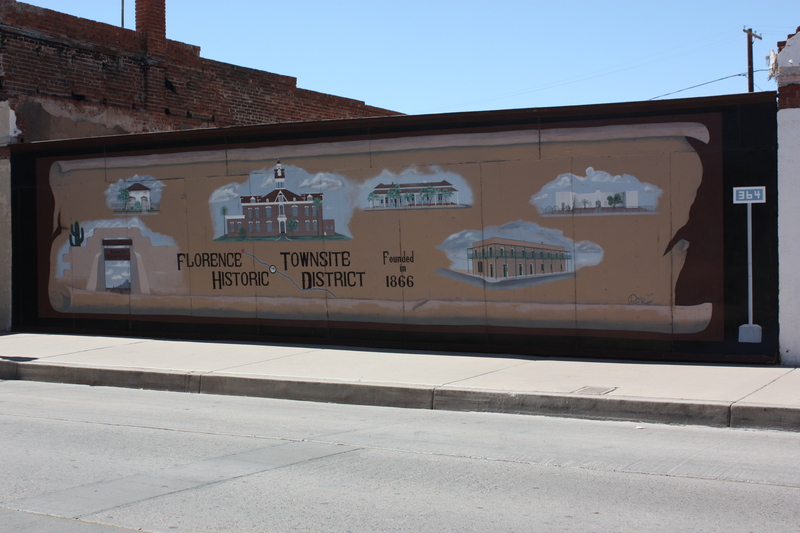 Our main interest in passing through Florence was that it was said to have a “lovely” main street with 25 buildings having been designated as National Historic Landmarks. I have to take issue with the writer’s use of the word “lovely”, as much of Main Street was in a state of disrepair, or at the very least, undergoing major restorative work. Unfortunately it was also completely deserted as everything was pretty much closed up on the Sunday afternoon that we passed through town. 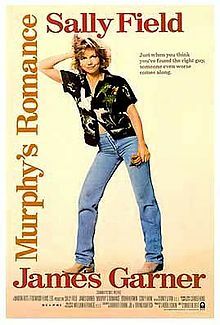 I love “pop culture” for all sorts of different reasons, so I found it interesting to discover that the 1985 “rom-com”, Murphy’s Romance, starring Sally Field and James Garner, was shot in and around the town of Florence, and that Carole King who wrote and sang the theme song for the movie (“Love for the Last Time”), even had a “bit” part in it. Garner was actually nominated for an Academy Award for his work in the movie, but I don’t even remember it. I’ll have to check it out on Netflix when I get home. 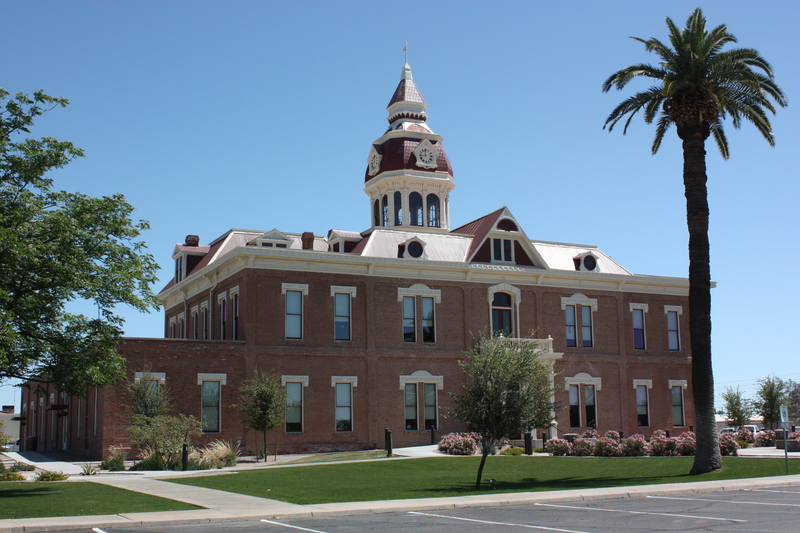 A building that we did find interesting was the Pinal County Courthouse located a block east of Main Street – a grand old structure that had been completed in 1890-1891. The building itself has been recently restored after falling on tough times, so it looks particularly attractive right now. 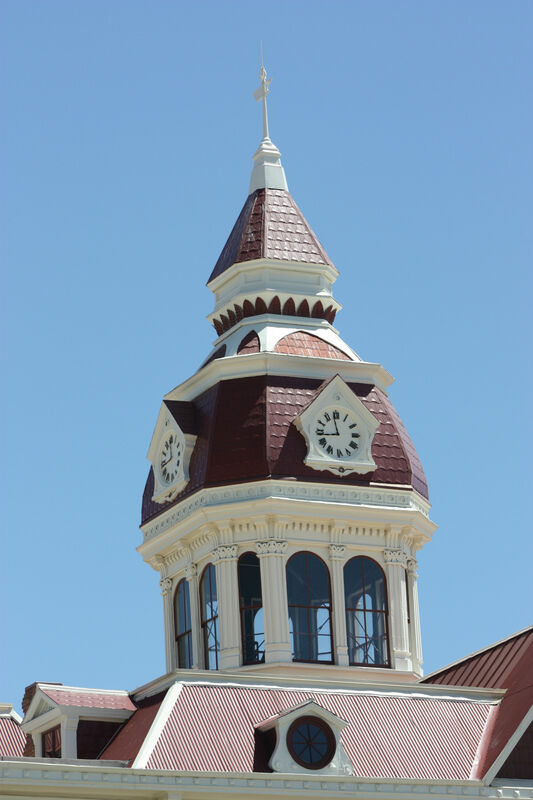 What makes this building so interesting is that during its original construction back in 1890-91, the town ran out of money before proper clockworks could be installed, so they permanently painted the time of 11:44 on the clock-face, and that is the way it remains to this day. I guess that time really does stand still in Florence, Arizona. 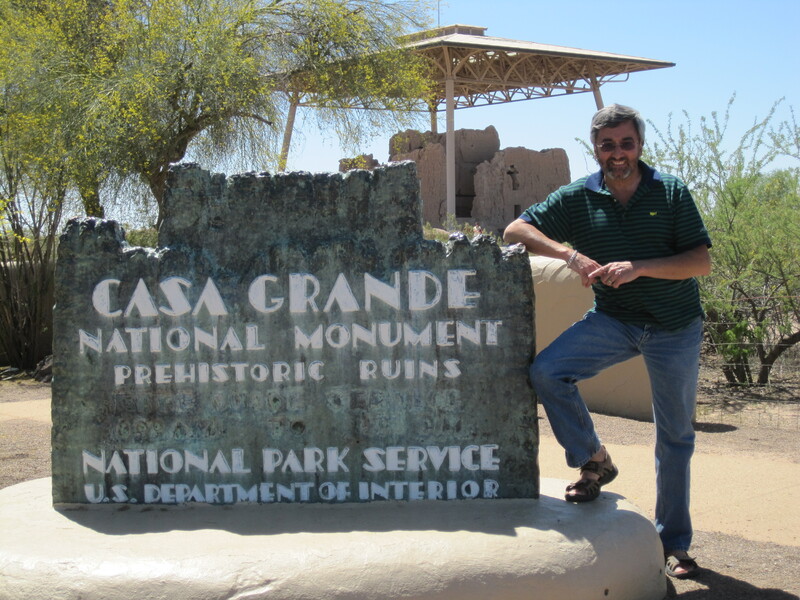 Somewhat underwhelmed by Florence, we set the wheels in motion again, and headed a further 10 miles south to the Casa Grande Ruins, located at Coolidge, Arizona. I previously wrote about them in a post entitled “Ancestral Ruins of Arizona”, but they bear mentioning again, as they were really quite remarkable. 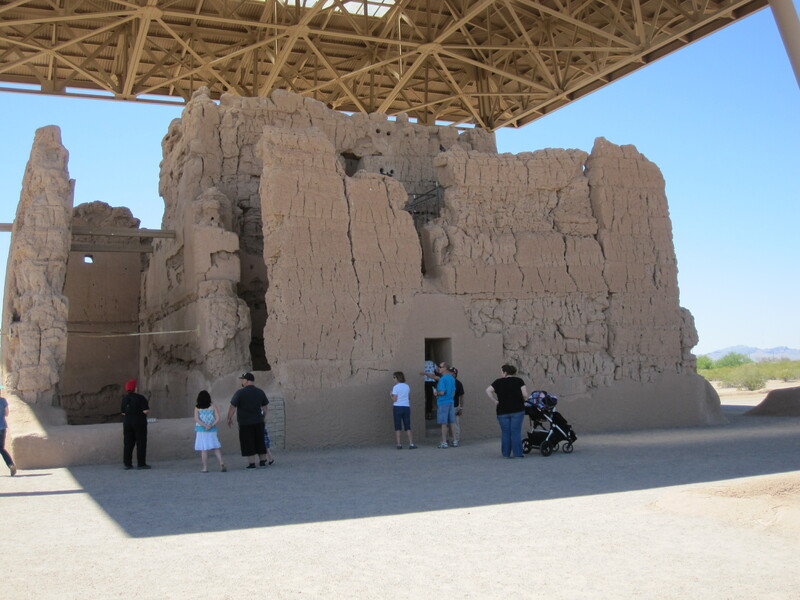 These ruins are associated with the Ancestral People of the Sonoran Desert, and the building in the picture below, is the largest physical structure that has been found in any archaeological dig in North America, at four stories high and 60 feet long. The ancestral people are called the Hohokam by archeologists and they were brilliant as it relates to what they built, given how meagre their resources were. At one time, a 7-foot high wall surrounded the entire compound which contained houses, work areas, courtyards and storage rooms. 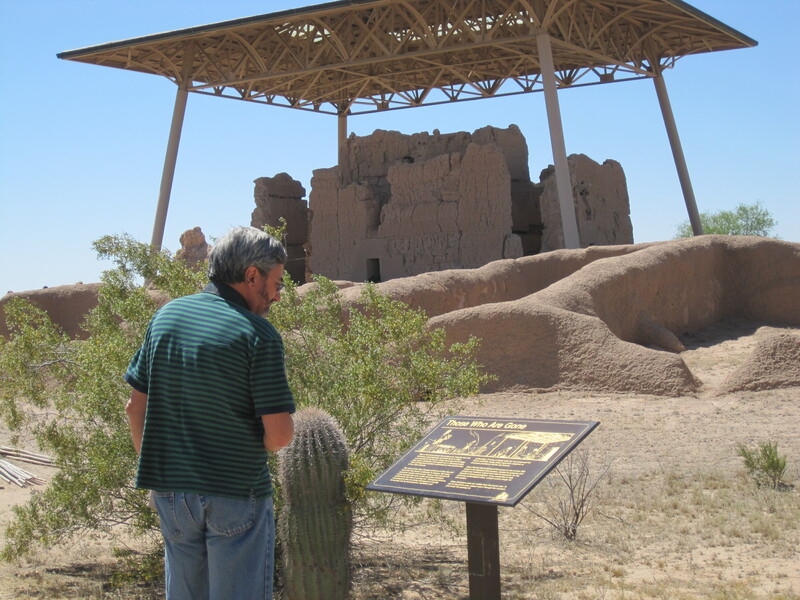 The Casa Grande Ruins are four times larger than any other compound that has been found, and it contains the one-of-a-kind building at its’ center – the Casa Grande. 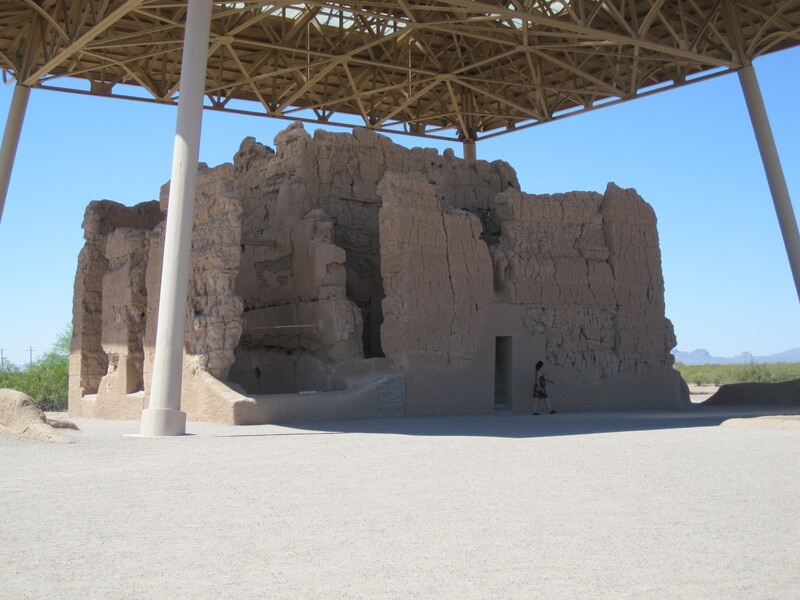 Like the people from the ruins we visited in the northern part of the state, the Hohokam society suffered from a decline from which they never recovered, and by the late 1300′s, the Casa Grande compound was gradually abandoned. The ruins lay “undiscovered” until 1694 when a Jesuit missionary visited and documented the remains. He is the one that gave Casa Grande its name. Preservation of the site started in 1889 through an act of congress, and badly eroded wall foundations were braced with wooden beams and metal rods. In 1903, a small roof was placed over the Casa Grande to protect it from the sun, and it was replaced in 1932 with the large roof that is visible in the pictures. Given our somewhat “late-ish” start to the day, it was nearing 4 PM in the afternoon as we left Casa Grande, so it was time to “close the loop” on our Loop drive and hit the I-10 for the final stretch into Tucson, roughly 70 miles to the SE. 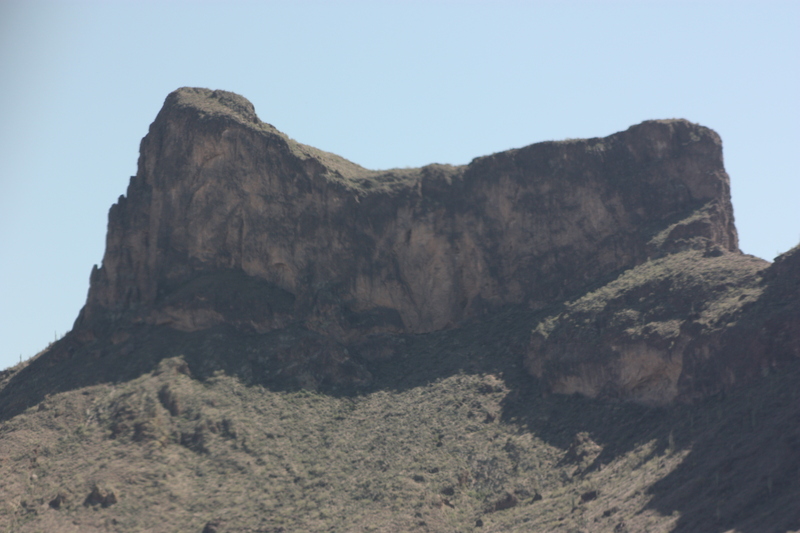 About 45 miles North of Tucson, I noticed a rather large rock outcropping on the right side of the highway. I looked on the map and it was identified as Picacho Peak. I then noticed a sign that said Picacho Peak State Park, followed by another that said “historic marker ahead”. 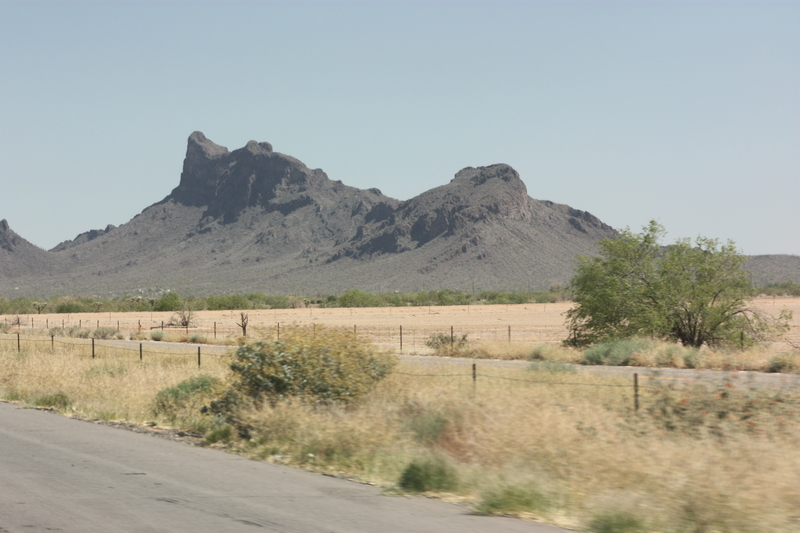 I googled Picacho Peak to find out what its signifance was, and it turns out that it was the site of a February 1882 Civil War confrontation in which the Confederate army tried to maintain its hold on Tucson and was briefly successful in doing so. 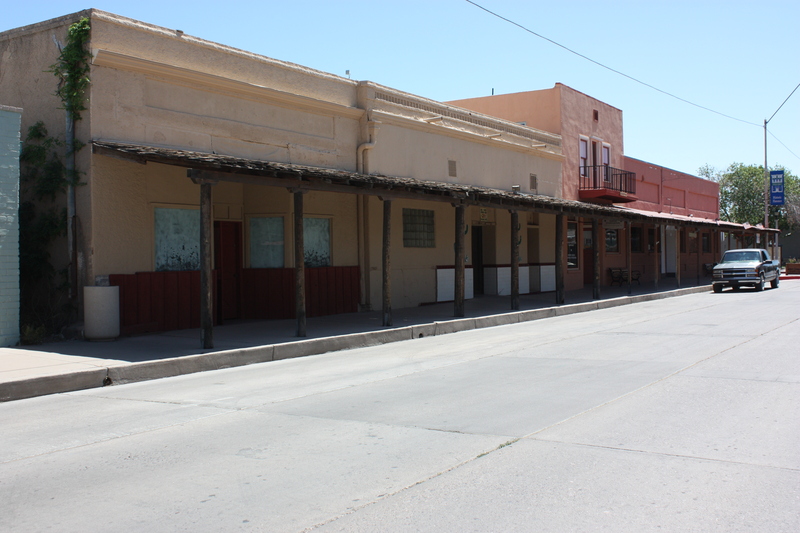 Ultimately, the Union was able to capture Tucson, when it was peacefully surrendered a mere two months later. 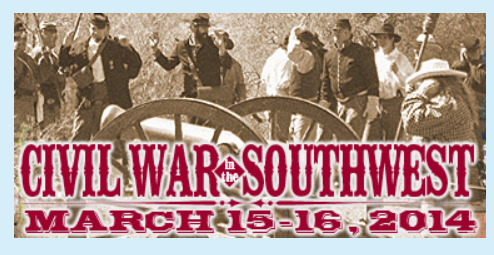 Apparently, there is a very popular Civil War re-enactment that takes place at the State Park each year and it is heavily attended by “enthusiasts” as the battle was historically significant in that it was the westernmost battle of the Civil War. Next Post Tucson, At Last!